Most observers perceive that the ring of lines rotates slowly, with brief jumps of much faster rotation in the opposite direction. The very fast jumps are illusory. The illusion usually gets stronger after one or two jumps, and seems to be enhanced by paying close attention to the lines in the ring. The most famous illusion of movement is the motion aftereffect: look at uniform motion for a while, and things will seem to move the other way. It was discovered a long time ago by staring at a waterfall in Scotland, and, though important, is a bit boring: the illusory motion is slower than the real movement that induces it. As it turns out, the Scottish waterfall actually feeds… Loch Ness, and that just under the placid surface of the motion aftereffect lurks a true monster, capable of producing illusory motion a hundred times faster than the inducing movement. In the perpetual collisions illusion, the pink and the yellow columns seem always to be headed towards (or away from) each other, but they never meet (and they never grow further apart). Actually, the colored fields are completely stationary; an appearance of motion is generated by the spinning black and white diamonds located alongside the columns. Click on the button to add diagonal bars and remove the edges from opposing diamonds. Notice that the information at the edges makes the colored fields move diagonally, yet when the bars are not there and all the edges are visible, the fields move horizontally. Where Has All the Motion Gone? Click on the big button to toggle between a blurred version of the display and an unblurred version. When the display is blurred, the motion is dramatic; when the display is not blurred, there is only minimal motion. The effect can also be seen with a defocused lens. Blur eliminates high-spatial frequencies. It does not add information to the image. Why, therefore, does the removal of high-spatial frequencies add motion to the display? The buttons and levers allow control over the many of the parameters in the display. Please relax and look at the colorful brains: aren’t they rotating and bouncing?! They are, but only in your head. What’s going on? Some regions in the brains are darker, some lighter than the background. The perceived location of the separation between light and dark regions changes as the background is modulated, causing each brain to jiggle and bounce. In some regions these illusory motions of neighboring brains are coherent and are grouped together to give rise to an even stronger illusion. 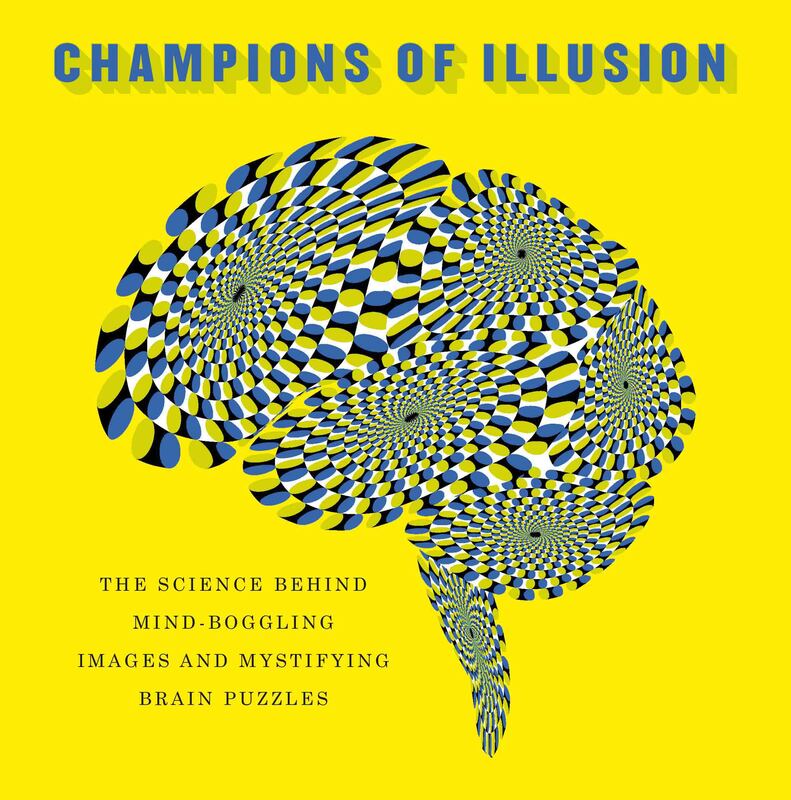 In the illusion , a small pink object can be seen moving back and forth in front of three types of background. When observers track the pink target moving back and forth in front of a background consisting of dynamic noise, they report the percept of a drifting background. The direction of this drift is opposite to that of the small pink object, even though the background in fact does not move into a particular direction. This illusory motion arises for a static gray Gaussian background, but is actually much stronger when the background is dynamic random noise. However, the illusion does not occur when the background consists of static random noise. Fixate the black fixation point on the far left side of the image. Note that the figure appears to move steadily away from the fixation point, even though it is in fact only moving up and down. Fixate the central fixation spot. Notice that the two balls on the left and right appear to be bouncing toward fixation, even though they are in fact remaining at a constant distance from the fixation point. Best viewed on a large screen.